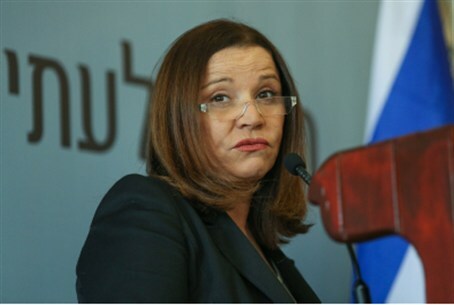 Yachimovich insists that she can unseat Netanyahu but admits that chances are not high. Labor party head MK Shelly Yachimovich said Saturday that she believes that if her party receives 25 Knesset seats, President Shimon Peres will entrust her with creating the next government coalition. "Netanyahu is weaker than ever and in actuality, based on depth surveys we have carried out, after one peels off Lieberman's party, Likud receives no more than 21 seats today," she said. "If the Labor party receives 25 seats, the president will entrust me with assembling the coalition. I know it's difficult, I realize the chance is not high, but it certainly exists," Yachimovich explained at a live interview panel at Modiin. Yachimovich said, "Tzipi Livni made a bad mistake when she refused to join forces with me, during a long period of time, when I came to her house again and again. I offered her the ultimate offer for creating a common force for replacing Netanyahu, very generous offers and dignified ones, and all of this was done discreetly, seriously, and not as a blatant spin that serves no purpose at this late stage."